In the Ironsworn tabletop roleplaying game, you are a hero sworn to undertake perilous quests in the dark fantasy setting of the Ironlands. You will explore untracked wilds, fight desperate battles, forge bonds with isolated communities, and reveal the secrets of this harsh land. Are you ready to swear iron vows and see them fulfilled—no matter the cost? Guided: One or more players take the role of their characters, while a gamemaster (GM) moderates the session. Co-Op: You and one or more friends play together to overcome challenges and complete quests. No GM required. Solo: You portray a lone character driven to fulfill vows in a dangerous world. Good luck! 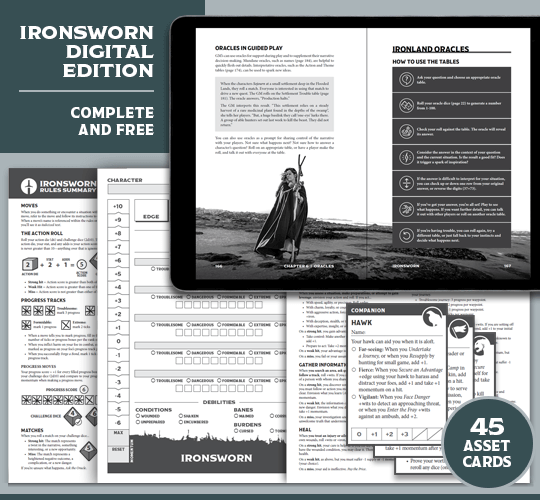 The Ironsworn digital package is free and complete. It includes the rulebook, character sheet, over 45 printable asset cards (with more available! ), and extensive reference materials. The rulebook PDF is bookmarked, searchable, and optimized for fast tablet display. Portrait and landscape (two-page spread) formats are included. Select the PDF option (above) to add the digital edition to your account. 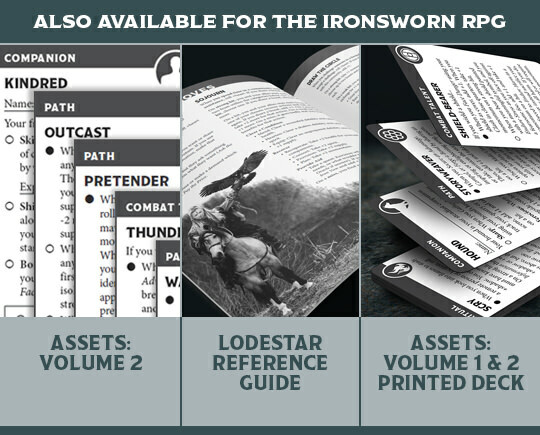 Note: The print version shows as "color" in the product summary, but the interior of the Ironsworn rulebook is actually black and white. The color printing process is used for heavier paper and improved image quality. 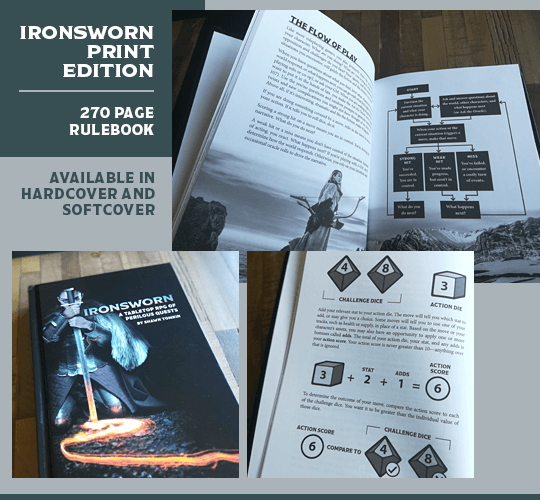 The print edition includes the Ironsworn rulebook in your choice of hardcover or softcover. The rulebook is 6x9, 270 pages, heavyweight 70# matte paper, glossy color cover, and black and white interiors. All other materials, including the character sheet, asset cards, and reference materials, are provided in digital format. Select a print+PDF option (above) to purchase the book and add the entire digital edition package to your account. "During no other roleplaying game, and certainly not during a solo game, have I ever felt myself so on edge to find out what happens next ... All in all, probably the best new rpg I've played all year." "This is a well designed, clearly presented and extensively playtested product ... The rules are designed for flexibility and the author provides detailed advice to adapt the game to different settings." "This is on the path to becoming one of my (if not THE) go-to choices for gritty narrative fantasy games." "Frankly, this is one of the best uses of the PbtA rules I've ever read. Evocative, simple, and the quality of the book is high for it being completely free." "The use of world building, character generation, and character-driven story all weave together to form a tapestry unlike anything I have seen before in RPGs." What I love about this is how it allows solo play to have that crunch I enjoy without taking hours to prepare for a ten minute solo run. It also allows for a large amount of rulings from the player without breaking it. Technically, I used the Lodestar edition because I don't own the printer, but I always use the oracles. They're handy for generating the things a GM normally would, without requiring a lot of jury-rigging. My favourite rpg book at the moment . Tons of fun to play , extremely well written and clear and the setting is great! Hi folks. Just discovered this game... and like virtually everyone else who lays eyes on it, I *love* it. My favorite PbtA style game by a county mile, and one of my favorite RPGs in years. It helps that low fantasy also happens to be my jam, but -everything- about it just rocks. Now, a question -- gonna get it in hardcopy, which I rarely do with RPGs these days. How is the POD quality of the hardcover vs. softcover? Anyone want to offer an opinion on either? The POD book is great. It's nice and light, the binding is good, and the text is clear. I'll likely get a second copy some time in the future for my kids. I have the hardcover, the book is well put-together and very sturdy. It's a bit smaller than you might expect (kind of a digest size) which makes it easy to carry. My only complaint (which really isn't one) is that the binding is quite tight, so you have to work it a little to get it to stay open easily. The art translates really well to print and it's a beautiful book that I love showing to people when I introduce the game. Welcome to the community! Thanks for the kind words, John! As Justin noted, the only caveat I would apply to the print-on-demand hardcopies is that the glue binding is a bit tight, but it does get better with use. There are a few minor erratas for the print version, which you can see in your PDF library (Ironsworn-Errata.pdf). Thanks for the replies, Shawn, Kurt, Justin. Decided to get both the soft and hard covers and either greedily keep them both or give one of them away... should be arriving soon. An absolute masterpiece of a RPG. The very best when it comes to solo RPG, the world and mechanics really drives the story in unexpected and fiction-coherent way. It been years since I have seen such an inspired product. Thank you so much! That makes me super-happy. And thank you also for sharing your awesome character sheet with the community. Spectacular! The sense of excitement and adventure builds just from reading this well written manual. Great job Shawn! The book feels sturdy, well printed and bound too. Thank you, Mark! I really appreciate it. Solo/Coop tabletop RPG is something we don't see often. The game is very well designed, it feels like a pbta game and yet it has its own unique twists. The dice mechanic is brilliant. Layout is very smooth and elegant, easy to read and tablet friendly. Everything in the book, from images to examples, has a very distinct mood and is always very evocative. It seriously is my favorite RPG reading this year. I can't wait to try it out! Thanks! I really appreciate it. Please let me know how it goes once you try it out. Congrats, Shawn and nicely done! Super minor piece of feedback regarding the Asset cards: the sheet of back images of the companions and paths (first back image sheet) is not laid out such that double-sided printing is possible. That is, because 2 of the companions are 'left-aligned' on the front, the corresponding back images should be 'right-aligned'. Thanks, Sam! 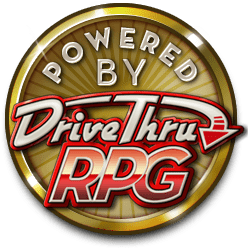 This was noted a few days ago by a helpful community member as well, and the DriveThruRPG files should be updated to correct the issue. You will now find a version with alternating fronts/backs with the mixed rows flipped for duplex printing (Ironsworn-Assets-Volume-1-With-Backs.pdf). There is also a non-backs version for folks who don't want to print the backs (Ironsworn-Assets-Volume-1.pdf). Holler at me if you run into any issues. I never understood all the hype about PbtA until I got this game. Highly recommended. I can't wait for PoD option. This game is awesome. Every thing about this game is professional and beautifully done. Thanks Phillip! I appreciate it. Fantastic! Well written and beautifully put together. I want to buy a hard copy! 5 stars! Thanks, Maria! Printed copies will be available here once I've finalized the PDF and completed the proofing process (a month or so?). Won't let me rate it for some reason, but def a 5 start product! I had the same issue when I purchased it. I had to repurchase and now I can rate it.